Recently, my health demands reduction in salt intake and a change in lifestyle that demands reduction in weight through regulation of food intake accompany with physical exercises which include walking,jogging and every other exercises that can aid reduction in body mass. In a bid to control my food intake,the necessity to reduce carbohydrate and sugar intake became paramount and the intake of fruits and vegetables is of essence. While researching and surfing the web, I was able to get in contact with many fruits and vegetables that are good and appropriate for healthy living but the necessity to reduce the salt intake and replace it with more of potassium for a healthy heart function was urgent. Suddenly, I discovered that the potassium level in Water Melon, known botanically or scientifically Citrullus lanatus is high and it is quite enough to relax blood arteries that has become stiff by the bad effect of salt intake in the human body system. Since this discovery has been made, I have made it a responsibility and a duty to end my day with Water- Melon. With this discovery, I made it a point of duty to share the benefits of Water Melon in maintaining salt level that could constitute serious health challenge to the main part human life known as the heart. Watermelon is quite low in calories. A single serving of watermelon contains just about 46 calories. The fruit is replete with vitamins. Two of the major vitamins in watermelon are vitamins A and C. The vitamin A in watermelon is present in the form of carotenoids. Watermelon is also a good source of vitamin C. A cup of fresh watermelon contains about 12 milligrams of vitamin C.
Around 175-200 calories of fresh watermelon gives you 3-4 grams of dietary fiber, which is a nice mix of soluble and insoluble fiber. A single serving of watermelon contains about 11.6 grams of carbohydrates, which is a combination of dietary fiber, starch, and sugars. The fruit has very less fat content. A single serving has just about 0.2 grams of total fat. One of the most important nutrients in watermelon that is responsible for most of its benefits. Well, that’s about nutritional value of watermelon. Now, let’s see what are the amazing watermelon benefits! According to research, having a slice of watermelon every day can halt the accumulation of bad cholesterol, thereby preventing heart disease (1). Regular consumption of watermelon has also been linked to fewer fatty deposits inside the blood vessels. These heart-healthy properties of watermelon can be attributed to citrulline, a chemical found in the fruit. As per a Kentucky study, citrulline can have beneficial effects on atherosclerosis (2). 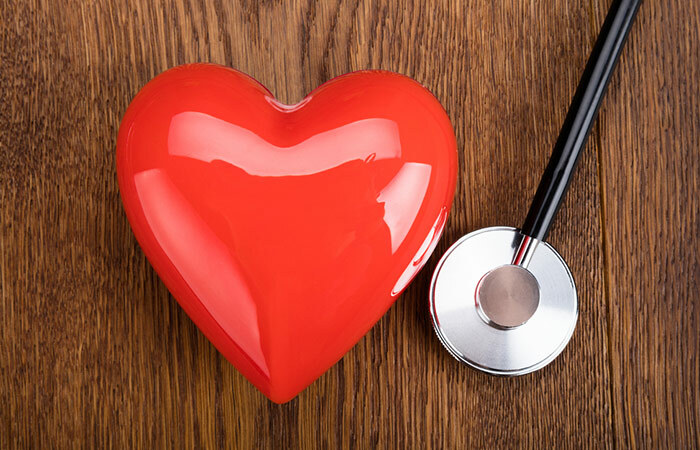 Citrulline has also been found to reduce arterial stiffness in postmenopausal women (3). Another primary compound found in watermelons is lycopene, which has great benefits. In one American study, lycopene was found to exhibit anti-inflammatory properties (4). Amongst the different carotenoids, lycopene is considered the best (5). In fact, the beneficial effects of lycopene for inflammation are considered even better than beta-carotene, an important carotenoid (6). Wondering what percentage of watermelon is water? As the name of the fruit implies, watermelon is 90% water, making it one of the best sources of hydration (7). It is far better than alcohol or caffeine in terms of being a diuretic. As it is a natural source, it increases urination without stressing the kidneys (8). Lycopene gets the credit, again. According to a study, lycopene in watermelons has been found to reduce the extent of cancer insurgence (9). Lycopene is the pigment that renders watermelons their characteristic red color, and since it is a powerful antioxidant, it prevents the onset of certain cancers (10). A two-cup serving of watermelon contains about 20 milligrams of lycopene, which battles free radicals and protects against numerous types of cancer (11). According to a Chicago study, lycopene exhibits chemopreventive properties, especially in prostate cancer cells (12). Lycopene has also been found useful in the treatment of HPV (human papillomavirus) infection, which might otherwise lead to uterine cancer (13). If your sore muscles trouble you after a workout, watermelon might hold the key. The fruit is packed with electrolytes and the amino acid citrulline, which help soothe sore muscles after a heavy workout (14). And as per an Iranian study, citrulline in watermelons can help reduce muscle fatigue (15). Citrulline has also been externally added to watermelon juice to check its effects, and it has been proven that it is only the naturally occurring citrulline in watermelons that has any effect on muscle soreness (16). Citrulline has been found to accelerate the process of lactic acid removal, thereby relieving muscle soreness (17). Drinking watermelon juice can also help your muscles receive more oxygen – this helps them recover faster (18). 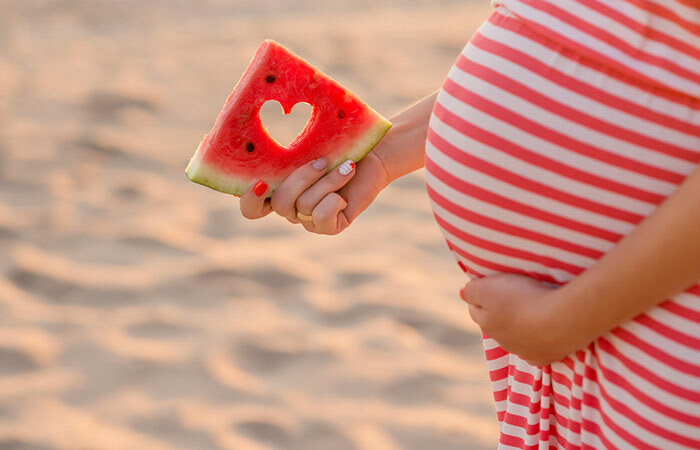 Watermelon eases heartburn, a common condition during pregnancy. It also helps alleviate morning sickness (19). The minerals in the fruit can help prevent third-trimester muscle cramps. Watermelon can be good for pregnant women in other ways as well. As we have seen, watermelons are an excellent source of lycopene – which was found to reduce the risk of macular degenerative disease (20). According to Mayo Clinic, lycopene has been suggested as a potential treatment for eye disorders like macular degeneration (although further studies are required in this regard) (21). Antioxidants are essential for eye health as they offer protection against free radicals. The effect of free radicals can be scary – they might lead to the deterioration of the eye lens, and can even cause blindness. Lycopene, being a potent antioxidant, prevents this (22). Watermelon also allows people who have asthma to breathe properly, without them having to take each breath in panic (24). A study conducted on 17 asthmatic adults showed that lycopene might have a therapeutic effect on the disease (25). As per a report, adequate intake of lycopene and vitamin A could be beneficial for asthmatic patients (26). Watermelon is the richest natural source of citrulline. 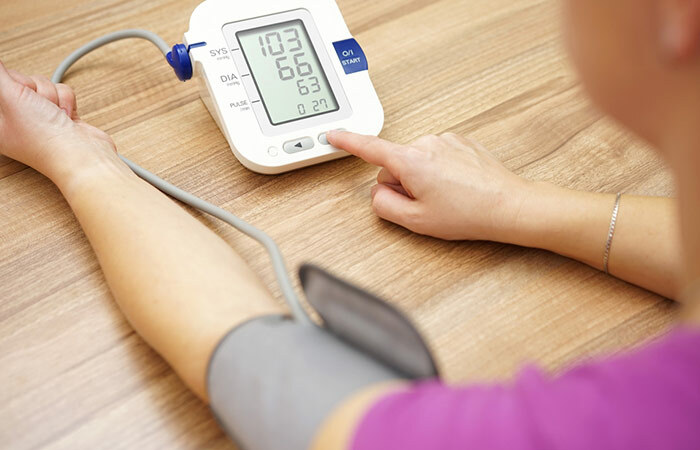 And according to a study published by the Florida State University, citrulline is closely related to arginine, which is an amino acid essential for maintaining healthy blood pressure (27). Another study that had volunteers consuming concentrated watermelon juice found increased levels of arginine in them, which was likely to have been converted from citrulline (28). Watermelon also is a good source of potassium, the nutrient that is known to lower high blood pressure (29). Potassium is also an electrolyte that regulates blood pressure during physical exercise (30). Watermelon is a good source of vitamin C, the nutrient that is essential for collagen synthesis (31). Collagen keeps your skin supple and strengthens your hair. According to a German study, lycopene and beta-carotene can protect the skin against sunburn (32). Beta-carotene is also known to prevent certain skin conditions like psoriasis and vitiligo (33). Vitamin C plays a major role here as the nutrient is good for the bones and aids wound healing (34). A Switzerland study suggests that lycopene supplementation can prevent osteoporosis and bone fractures (35). Vitamin A in watermelons has been linked to bone growth (36). One of the best watermelon health benefits is that it aids in healthy weight loss too. 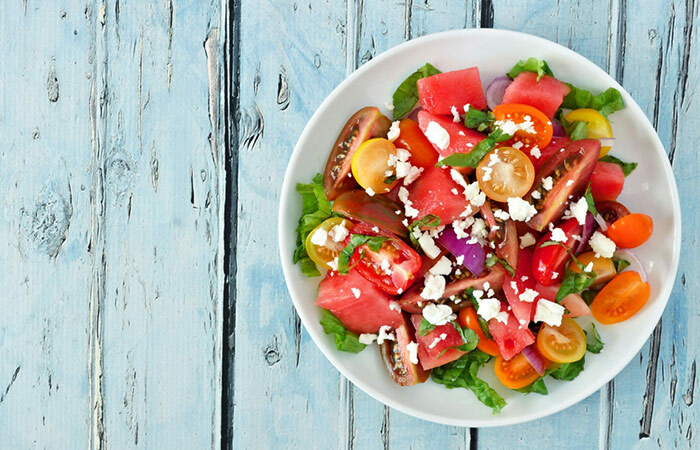 Yes, given its high water content, watermelon can fill you up for fewer calories (37). Water has also been found to speed up metabolism and flush out toxins and fats, which eventually might contribute to weight loss (38). One wedge of watermelon has just about 86 calories, less than 1 gram of fat, and no cholesterol. It provides 22 grams of carbs and 5% of your daily fiber requirement, making it a great food for fat burning and weight loss (39). Though watermelons could be good sources of potassium, the percentage is lower compared to most other foods. This is why it can be good for people suffering from chronic kidney disease, who need to stick to lower-potassium fruit options (40). However, in some individuals suffering from chronic kidney disease, the kidneys may not be able to remove the excess potassium from the blood. This can raise potassium levels in the blood and lead to complications. Watermelon, being rich in vitamin C, strengthens the body’s immune system (41). The fruit also contains vitamin B6 that helps the immune system produce antibodies (42). The vitamin also aids in the formation of red blood cells. The fruit has vitamin A that regulates the immune system and protects it from infections (43). What is the link between watermelon and diabetes? Although watermelon has a high glycemic index, it has a lower glycemic load (the value by which a particular food will raise an individual’s blood glucose levels), and hence is suitable for diabetics. In a Nigerian study, watermelon was found to have anti-diabetic properties (44). Another study showed the beneficial effects of watermelon pomace juice – it increases the mass of brown adipose tissue and reduces excess white fat mass, which eventually helps treat diabetes (45). However, take your doctor’s advice in this regard – as certain small-scale studies have stated otherwise. The amino acid citrulline in watermelon relaxes and dilates the blood vessels and might aid in the treatment of erectile dysfunction (46). Citrulline is converted into arginine, which is a precursor for nitric oxide that helps in blood vessel dilation. 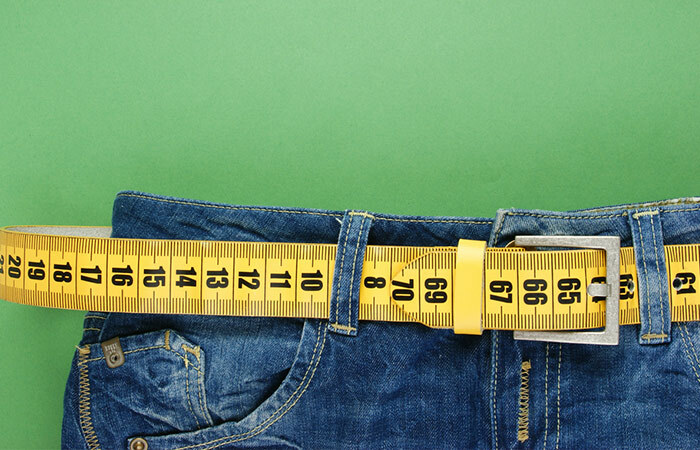 According to an Italian study, oral citrulline supplementation has been found to improve erection hardness in men suffering from mild erectile dysfunction (47). Watermelon can also act as a natural viagra (48). The ingredients in watermelon, especially the phytonutrients, react with the human body and trigger such reactions. Watermelon, being rich in lycopene, protects the cells from damage associated with heart disease. Lycopene fights the free radicals and prevents cell damage (49). Given its high water content, watermelon is known to prevent hyperthermia (50). It has a lot of significance in Chinese medicine as well – watermelon is one of the few fruits that clears heat and relieves irritability and thirst. It also relieves heat exhaustion, for which the outermost layer of the rind is used (51). The vitamin C in watermelon keeps the capillaries and gums healthy (52). The deficiency of vitamin C can cause bleeding gums and gingivitis (inflammation of the gums), and watermelon can prevent these conditions (53). Watermelon is a good source of vitamin B, which is responsible for energy production in your body (54). The fruit is low in calories and high in energy, and it can help you stay active for the better part of the day (55). Another reason you must have a watermelon to stay at the top of your game is potassium. Potassium is an electrolyte that keeps you from feeling tired after an exhausting day (56). Watermelon, as we have seen, is not just replete with water – but with great benefits as well. You will be surprise to know interesting facts about watermelon – what we will see now. The largest watermelon ever grown weighed 122 kilos! This record was set in 2005, at the Hope Arkansas Big Watermelon Contest. There are over 1,200 varieties of watermelon (in 96 countries) that are grown across the world. Thought tomatoes are the richest in lycopene? Maybe not. Watermelon contains 40% more lycopene than raw tomatoes. The Japanese grow square watermelons. They place the growing fruit inside square glass boxes, and the fruit takes the shape of the container as it grows. Literary legend Mark Twain loved watermelon and called it the food of angels. It is both a fruit and a vegetable. It is a sweet and seed-producing plant, and the watermelon rind is entirely edible. What an amazing frui…vege…frui…well, whatever! The benefits of eating watermelon are incredible. The facts are mind-blowing. And now comes the most important part – how do you buy watermelons and store them? What do you need to keep in mind? You need to look for a firm and symmetrical watermelon that is free of cuts, bruises, or dents. Any irregular lumps or bumps would mean that the fruit received insufficient amounts of sunshine or water. Lift the melon. The fruit must be heavy for its size, which means it is full of water, and therefore, ripe. You can try comparing the melon with another of the same size – the heavier one is what you must go for. You need to look for the field spot. This is the spot where the melon sat on the ground in the sun. Hence, the darker the field spot, the better. You will find it on the underside of the watermelon. If the field spot is white or nonexistent, it simply means it was picked too soon (and probably isn’t ripe). The perfect watermelon is dark green and looks dull. If the watermelon is shiny, keep it aside. In case you are purchasing pre-cut watermelons, choose the pieces with bright red flesh and black or dark brown seeds. Avoid the pieces with white streaks or that have too many white seeds. A whole, uncut watermelon can be stored for up to a week in the refrigerator. Ensure you handle the fruit carefully to avoid bruising. Also, make sure you don’t store the fruit below 4 degrees C as doing so can cause chilling injuries to the fruit. You can cut the watermelon as you usually do. Simply run the blade of the knife down the sides of the fruit. This will cut the rind from the flesh. Cut the watermelon into round disks, and then cut the disks into 1-inch cubes. If you are not consuming it immediately, you can place the cut watermelon in a covered container and refrigerate for up to 3-4 days. Yes, having watermelon has its benefits. But one can’t just keep consuming the fruit as it is always, right? How about including the melon in your diet in a few offbeat ways? That’s why we have included a couple of recipes. Excluding the olive oil, lemon juice, and salt, combine everything else in a bowl. Mix well. Add the olive oil and lemon juice to the mixture. Cut donut shapes from the fruit. All you have to do is make 1½-inch thick round slices and make a hole at the center. Add sugar to the sour cream and stir to sweeten it. You can also add a touch of vanilla extract to lighten it a little more. Frost the watermelon donut slices. Sprinkle them with the silvered almonds. All great. We have seen the numerous ways watermelons can make your life better. But there is another side to this entire story – the side effects. Yes, watermelon is great. But it does have certain side effects one must be aware of. As we have seen, most benefits of watermelon can be attributed to lycopene. And the same compound can also cause side effects if the fruit is consumed in excess. Lycopene overdose can cause nausea, vomiting, indigestion, and diarrhea. Excess consumption of watermelon can result in hyperkalemia, a medical condition where the potassium levels are above normal. This can lead to cardiovascular issues like irregular heartbeats and a weak pulse. Certain individuals might develop allergic reactions to watermelons. These can include mild to severe rashes and facial swelling. Watermelon is a must-have, especially during summers. No doubt about it. Its high water content makes it a strong weapon against heat stroke and other related issues. Now you know what is watermelon good for and why you should include it in your daily diet. Start eating watermelon today, and beat the heat like never before. In conclusion, if you have been diagnosed with High Blood Pressure with systolic and diastolic measure above normal, the best is to change your lifestyle and one of the means of changing your eating lifestyle is to make Water -Melon your friend.